Whether you are coming to Thailand for the first time or you have already got to know the Siamese Kingdom, the fascination of Thailand will capture you forever. The tolerant and peaceful bearing of the Thai people is the heritage of millenniums of Buddhist tradition. You will be welcomed as a guest with the traditional friendliness and courtesy of the Thai people. Koh Mak, a clover leafed shaped island in the Gulf of Thailand, is one of the last island paradises in the area. Here there is no hectic rush, hardly any cars and no stress. 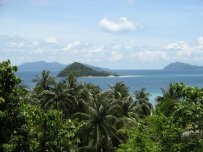 Around the island are dive sites which rank as some of the prettiest in Thailand The resorts on the island and the perfect white sandy beaches will ensure your stay on Koh Mak is a memorable one.